← Spot Prawns: BC’s most sustainable seafood . . . or is it? A while ago, I needed a recipe to take to a potluck appy affair. Four couples booked rooms in a hotel and we planned a progressive appetizer party, going from room to room prior to going out for dinner. With no refrigeration and no way of reheating, my old stand-bys were just not going to work, and I didn’t want to resort to cheese and crackers. I found this recipe on The Runaway Spoon and it seemed to fit the bill perfectly. I love the combination of sweet and salty that the figs and cheese offer. 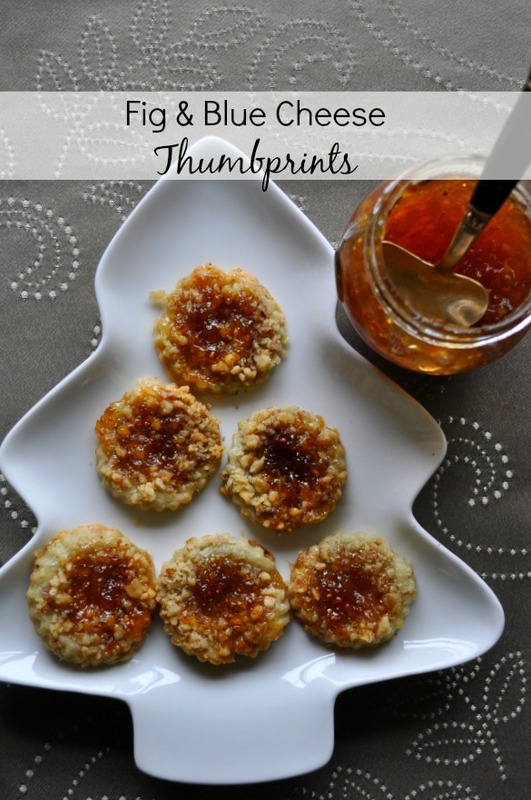 I have adapted it for holiday entertaining by adding the walnuts on top (to hide the blue tinge from the blue cheese) and made these using the traditional method for thumbprint cookies. Makes about 3 dozen bite-sized savory cookies. Put flour and butter in a food processor and process until the mixture forms rough crumbs. Add the blue cheese and pepper and pulse until it just forms a ball. Roll 1 inch balls, dip in egg white wash, roll in finely ground walnuts and place on baking sheets. Using the back of a melon baller or your finger, make a depression in each cookie, then use the tool to fill the depression with about 1/2 tsp. of the fig spread. Bake for 12 to 15 minutes until the edges are lightly brown. Cool for 10 minutes, then remove to a wire rack to cool completely. This entry was posted in appetizers and tagged appetizer, blue cheese, blue cheese an fig thumbprint cookies, blue cheese and fig savory appetizer, Christmas finger food, figs, savory, savory thumbprint cookies. Bookmark the permalink.